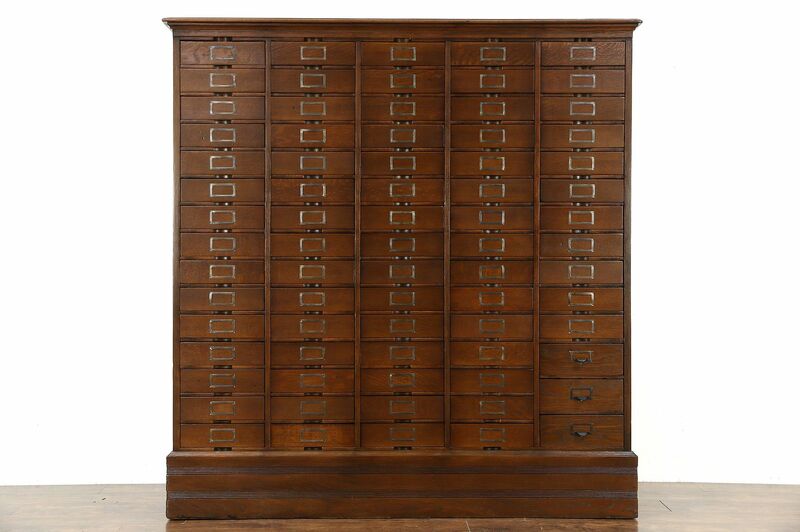 A solid quarter sawn oak file or collector's cabinet was crafted for a law office about 1900, and has 74 drawers. Seventy one drawers are identical, they have a spring clip to secure papers up to 12" x 9 1/2" and 3" deep. There are no backs but they could be added if desired. Label holders are original. Three deeper drawers have combination pulls and label holders. This American made library or office furniture is a single piece, it does not disassemble. The restored finish is in excellent condition, sides are paneled. Measurements are 6' wide, 14" deep and 75" tall.